When a person is stressed and unwell there are changes in the body e.g. pulse slows, pupils contract, heart rate alters, the person feels weak, the skin may be pale or reddened. Similarly with the subtle energy system there are associated changes too when the person is not at their best. These can be felt and measured by a complementary health practitioner. The holistic therapy kinesiology uses muscle testing to gauge the subtle muscle weakness which is caused by upset in the body and the subtle energy systems, whether this something that is emotionally stressing the person, or physically unbalancing or hindering the physical body and/or part of the subtle energy. In health kinesiology muscle testing the client’s arm muscle (only very gentle movement is needed) is used as the body’s gauge; to find out and check what makes the client feel stronger in themselves and also what are the causative variables in their life and lifestyle. Then muscle-testing is used to work out and perform the optimum balances for the client’s needs to complete the session. So kinesiology muscle-testing allows the client, via the trained practitioner, to access their own special information and memory held in the body self. Issues limiting the present and future potential of the person can then be worked on using muscle-tested epithets, acupressure and other kinesiology methods. So one can choose to respect the inner body wisdom. Due to the non-invasive and gentle yet powerful approach of health kinesiology, it is a perfect complementary therapy for restorative well being for the constitution, relaxation, clarity and focus, and inner peace and calm. With health kinesiology therapy, muscle testing is used to assess the body and then rebalance the body’s Bio-energy using holistic tolls such as acupressure, essences, crystals, stress memory regression so the person is more centred and grounded. For a kinesiology appointment call Claudia on 020 7272 4121 or use the Contacts tab on this website. There are several variations in kinesiology. All branches of kinesiology use muscle testing, and muscle-testing is used throughout the treatment. ’HK’ or ‘health kinesiology’, in particular includes, a vast array of psychological and emotional work to clear stress in the psyche and cell memory as well as the kinesiology muscle testing for allergies and food sensitivity, diet, nutritional supplements, detoxifying, and supporting the body against electromagnetic disturbance e.g. from mobile phones. Muscle testing is used to find what is weakening the energy system and what balances are needed. In a health kinesiology session with Claudia Benson acupressure, flower essences, life stress memory regression, polarity magnets, crystals and nutritional supplements are chosen to support the body as stresses are highlighted and cleared. Sometimes known as ‘HK’, health kinesiology is a complementary health therapy. Health kinesiology is a non-invasive and gentle, yet powerful holistic treatment which uses the special technique of ‘muscle testing’, complemented with acupressure and energy healing with flower essences, crystals, magnets and stuck thought release. The method of muscle testing particular to kinesiology therapy is so useful; with this technique the practitioner is able to ‘ask’ exactly what is going on in the person’s body to find and remedy any blocks, stresses, issues, and damage; whether it be from a specific emotional, spriritual, life event, or lifestyle causal factor/s. Clients have had health kinesiology therapy for work and relationship stress, self esteem and confidence, testing for food and environment sensitivity intolerance, allergy testing, exam nerves, fatigue, IBS, weight management, headaches, migraine, career creativity, memory and focus, detoxing, candida, candidiasis, digestive problems, memory, focus, PMT PMS, insomnia, anxiety, skin problems. HK, health kinesiology therapy is a perfect complementary treatment for restorative well being for the subtle energy, constitution, relaxation, clarity and focus, and for a feeling of inner peace and calm. HK, health kinesiology therapy can support you on your life’s journey and it is very useful in periods of life when things are very demanding, for an occasional check over, or for more regular boosts to your energy and how you feel in yourself, bringing back holistic well-being. Kinesiology muscle testing was developed from chiropractic muscle movement when the link between organs and strength of different muscles was made. This was combined with acupressure on the acupoints along the meridians -from Traditional Chinese Medicine. Kinesiology is different to other complementary therapies that use acupressure due to their unique ‘muscle-testing’ method. This was developed from the chiropractic observations where stress and weaknesses and strengths in a person can be picked up from a ‘muscle test’ of the various muscles. Due to the muscle testing method, often kinesiology is able to find causes and solutions and remedies which have long eluded them. The technique of muscle testing is used in kinesiology specially to access information held in the cell memory, mind and subtle energy systems in the body. 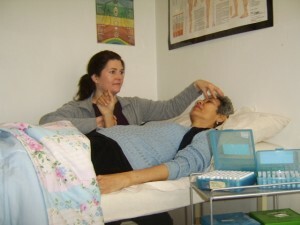 A gentle arm muscle ‘body questioning’ technique which is used to choose which balances and acupressure are needed to support the person in their well-being. The method of muscle testing in kinesiology is simple but remarkably extensive. Muscle testing functions to access the body’s whole system’s conscious and subconscious information. As an holistic complementary therapy, health kinesiology with its muscle testing technique works on a person’s subtle energy – acupoints and the meridians, chakras, auric field, and inner mind knowledge. The therapy is holistic, working with the whole person – subtle energy, spiritual side, emotional and the physical body. The subtle energy is the body’s natural inner healing system which gives the body its life force. In the modern world the body’s subtle energy gets depleted and overburdened. Day to day life stress can overload it. HK, health kinesiology facilitates change in the subtle energy system to maximise this inner resource. Blocks and imbalances that interfere with the needed bio-energy (Chi) flow in the subtle energy system which sends life force to the physical body, can be cleared by health kinesiology therapy. The health kinesiology therapy includes muscle tested acupressure, polarity magnets, flower essences and essential oils. Often the client will be asked to think something to help clear the psychological side of an emotional block. Home self-help advice such as an affirmation, changes to diet and other particular lifestyle points, nutritional supplements, something specific to do, priority things to avoid, may be suggested to support the subtle energy work that has been done in the health kinesiology therapy session. Clients find health kinesiology sessions intriguing and that they feel lighter and happier. Other positive shifts for the person often happen in the days and weeks after the kinesiology treatment. Having the holistic therapy health kinesiology can support you on your life’s journey. The holistic therapy health kinesiology is very useful in periods of life when things are very demanding, to find out something specific about what is causing or aggravating a more chronic condition or as a general ‘pick-me-up’. For a kinesiology appointment or to discuss what you are thinking you need kinesiology for – please call the practioner Claudia Benson on 020 7272 4121 or use the Contact tab on this website. Sessions are an hour duration with a fee of £65.